Now we officially move from the wines that you might pop open on a Friday or Saturday if you feel deserving after a hard week to the wines that you agonize over opening until just the right spot in their drinking window and just the right occasion because you know your budget won’t easily permit a replacement. 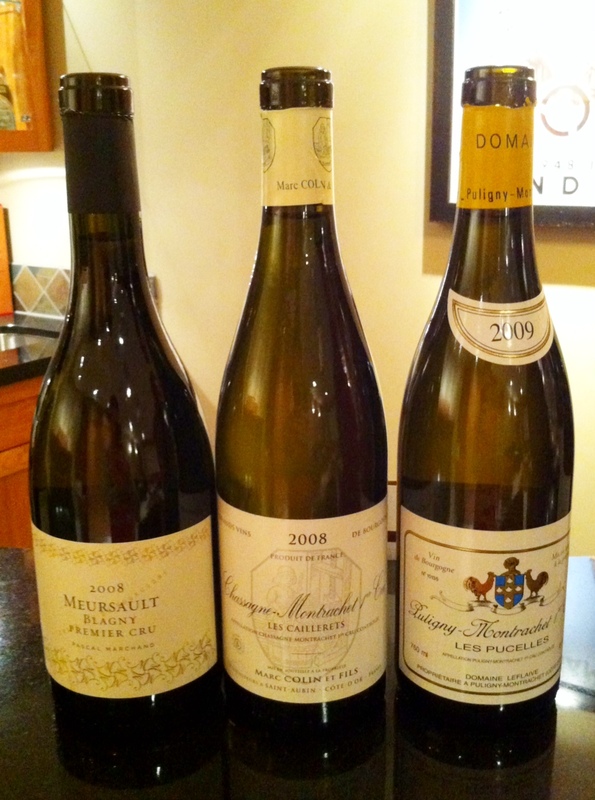 The combined retail cost of the flight of 3 village-level white Burgundies was about $180; the combined retail cost of the 3 Premier Crus below is almost double that, $340. This is why I didn’t buy any other wine from January until April. In the third flight of the evening we continued to highlight the top white Burgundy villages of Meursault, Chassagne-Montrachet and Puligny-Montrachet, and instead of village bottlings made from grapes that could be sourced from anywhere in the adjoining area, we narrowed our focus and opened a bottle from each sub-region made from grapes grown in a particular highly-regarded Premier Cru vineyard near the village in question. Every inch of land in Burgundy’s famed Cote d’Or region has been analyzed and classified over centuries, and those areas with the best soils, slopes, exposure to sunlight, drainage and growing conditions were isolated as Premier Cru or Grand Cru. That’s what we’re getting into: hundreds of years of liquid history. As I mentioned in my last entry, Meursault stands out amongst the whites of Burgundy for its forward, exuberant, oak-rich style, and just like its village-level counterpart, this Premier Cru was not shy about identifying its origins. Meursault doesn’t have any Grand Cru vineyards, so the best of the best in the sub-region are its Premier Crus. Blagny is on the southern edge of the area, bordering the village of Puligny-Montrachet, where there is a conglomeration of PC vineyards all bunched together. Notes: DEEP gold colour, the darkest yet…looks much older than a 2008. Unbelievably buttery and rich nose, overflowing with molten butter, rubber and cotton candy notes. I seriously smelled this for about 15 minutes (which possibly had something to do with it being bottle #8 of the night, but still). However, it tastes much less opulent than it smells, with surprisingly sharp acidity and more controlled flavours of pear, lemon, mineral and butterscotch. False advertising? I initially felt a bit betrayed by the gap between what was promised by the nose and what was delivered on the palate, but this divide did begin to close after the wine had some air time. I’d like to try this bottle again in a few years to see if a little more age helps to bring things together. Otherwise known as: a fun night. Our first Chassagne! You may recall that I tried to find a Chassagne-Montrachet village-level wine for flight 2 with no success, ultimately replacing it with a bottle from the nearby village of Saint-Aubin which was basically laughed out of the room when stacked up against Meursault and Puligny. There was ONE bottle of this C-M 1er Cru left in MetroVino when I went there, so somebody wanted to make sure that the village got represented at some point in this tasting. Puligny and Chassagne each straddle the vaunted Grand Cru vineyard of Le Montrachet, possibly the single best Chardonnay site in the world — Puligny to the north, Chassagne to the south — and each village has appended the name of its most famous citizen to the name of the town to increase the prestige and marketability of the whole area. Notes: Huge difference from the last wine: much paler, quieter, more austere. Saline and apple mix with fainter notes of kiwi, lychee and anise on the nose, with way less oak in evidence compared to most other wines featured in the tasting. I would not have said that this was a Chardonnay if I had tasted it blind…not necessarily a great thing for a wine from a classic Chard region? The surprise and mystery continued on the palate, as it tasted completely different from the 8 bottles that preceded it: slightly soapy, fairly neutral, with apple, honeydew and a sort of tutti frutti note in the midpalate. The finish didn’t linger, and the wine didn’t leave any kind of lasting impression. For the price tag and the pedigree, pretty disappointing. 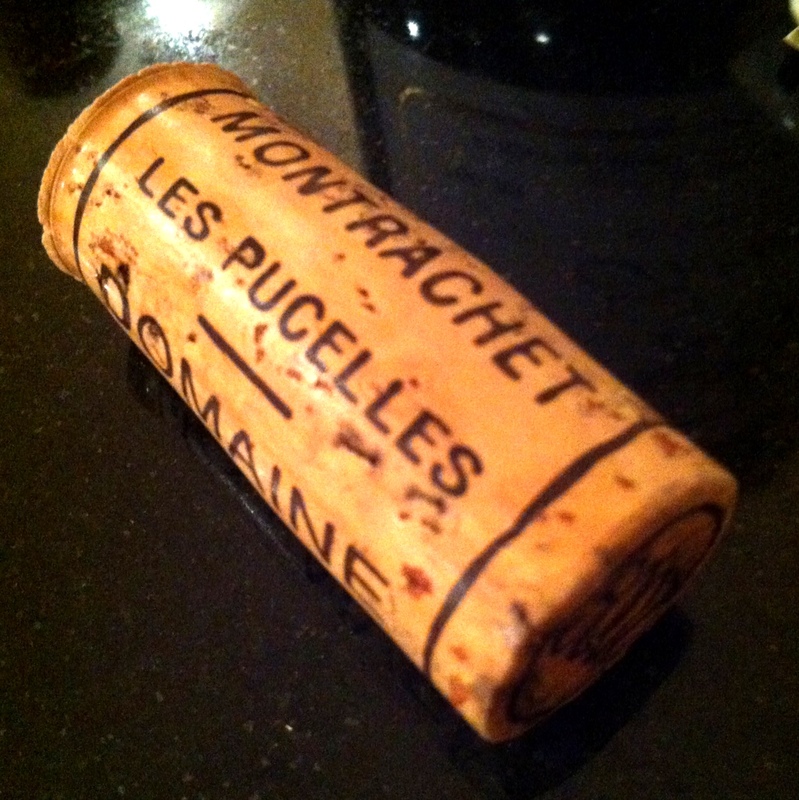 Here it is: the most expensive bottle of Burgundy I’ve ever opened. $200 and not even a Grand Cru, this bottle is actually more expensive than either of the two Grand Crus we bought for the tasting, making it the priciest wine of the night. How come? Location, location, location. Not all Premier Crus are created equal, and some are considered to be equivalent to, or even better than, some of Burgundy’s Grand Crus; this particular Premier Cru is one such star. Les Pucelles is ideally located on the northern edge of the famed Le Montrachet, the legendary vineyard that is bordered on all other sides by other Grand Crus. If all of Burgundy’s vineyards were re-classified today, it is largely believed that Les Pucelles would be promoted up to Grand Cru, and its price tag echoes its super-PC status. This was the most anticipated bottle of the night, and it completely delivered. What a showstopper. Notes: No surprise, this initially looks and smells much like Domaine Leflaive’s village-level Puligny-Montrachet, with a myriad of aromas ranging from crisp fruit (pear, grapefruit) to dairy (cream, butter) to baking spices (cinnamon, vanilla). On the palate, however, the wine separates itself and takes off. It’s just ALIVE, dancing as soon as it touches the tongue, bringing to the table both the weight of a wine with a ton of dense flavour and the elegance of one that is delicately and impeccably balanced. It’s quietly massive, a subtle blockbuster (yes, great wine invites description written in contradiction), with remarkable acid and a focused, lengthy finish but still thoroughly infused with a smoothness and lushness that speaks of the quality of its grapes and its production. The flavours themselves — apple, vanilla, burnt sugar, among many others — don’t yet fully tell the story of what this wine has to offer, a tale that will still be decades more in the making, but what is there right now makes everything that came before it in this tasting take a back seat. Definitely the wine of the night. Next up — the grand finale, the Grand Crus, and the end of about 5,000 words from me about white Burgundy. Until then!